If you’re looking for a go-to chicken drumstick recipe, you’ve found it. Garlic, paprika, and chili pepper make a classic seasoning mix that goes with almost anything – whatever vegetables you were planning on the side, they’ll probably play nicely with this chicken. And to make it officially classy grown-up food, take advantage of a secret weapon: a sprinkle of green onions. It’s like magic. Tasty, crunchy magic. 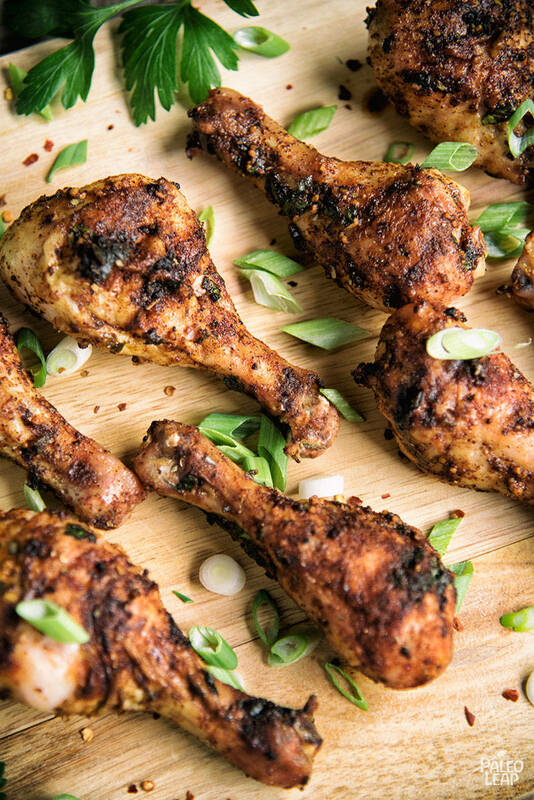 Drumsticks are also ideal for summer cookouts because they’re easy to eat with your hands (no need to struggle away trying to cut up steak or chicken breast on a flimsy paper plate), they’re kid-approved, and they make it easy for everyone to grab however much they’re hungry for. And if you have any left over, either carve off the meat and throw it in a salad, or just save them to eat the next day (they’re good hot or cold). If you wanted to throw, say, some sweet potatoes on the grill in the last 10 minutes while the drumsticks are cooking, you’d have a great and equally kid-friendly side. Pair it all with a salad and you’re set for dinner. Preheat a grill to 425 F.
Season each chicken drumstick to taste with sea salt and freshly ground black pepper. In a bowl, combine the olive oil, garlic, paprika, chili powder, and fresh parsley. Brush the drumsticks with the garlic-paprika mixture evenly on all sides. Place the drumsticks on the preheated grill. Grill for 30 to 35 minutes, turning every 5 or 6 minutes, and brushing with the remaining sauce.